The red ink on the federal government's budget showed no signs of fading as the annual financial report card revealed a $19-billion deficit for the second straight fiscal year. Expenses and debt payments were all up last year as overall spending hit almost $332.6 billion, leaving a deficit for 2017-18 slightly smaller than what the Liberals predicted in February's budget. Revenues were up too, including $9.9 billion more in personal taxes from the previous year, in what officials described as a "new normal" due to the full effects of a new tax bracket for high-income earners. 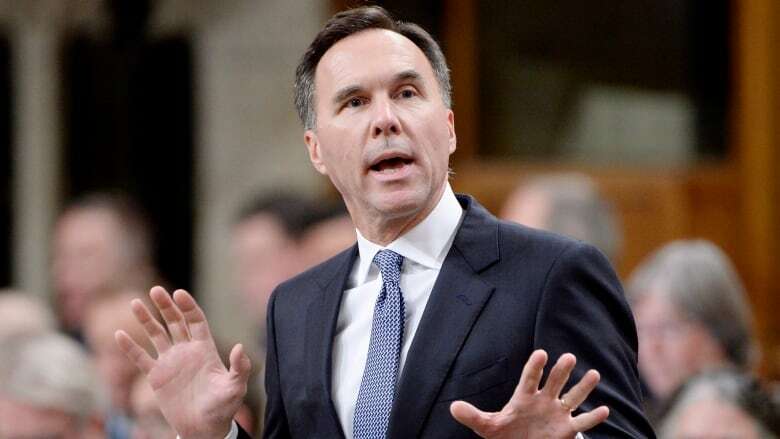 The numbers in the government's annual financial report released Friday — made public five weeks after the auditor general signed off on them — pushed the overall national debt to $671.3 billion. The result is revisions to 10 years' worth of budget numbers, which included turning the slim surplus the previous Conservative government left with much fanfare in 2014-15 into a small deficit. Conservative MP Dan Albas said the accounting change doesn't hide that the Liberals have blown past their own spending promises made to voters in 2015. "Canadians, I think, are going to be more concerned with the overall direction of government and not necessarily with some of these lines as to how things get reported," Albas said. "For me, the fundamentals of this government are still very clear — that they make commitments and then they do the opposite, and then they continue to break those commitments." Beyond 2017-18, Morneau's February budget predicted an $18.1-billion shortfall for this fiscal year — a number that's expected to gradually shrink to $12.3 billion in 2022-23, including annual $3-billion cushions to offset risks. Morneau is expected to update those numbers in the coming weeks when he releases his fall economic statement. Officials say internal projections still show the measure on a downward track, even if the numbers have shifted slightly from February's projections due to accounting methods. "This is an accounting change. I don't think it changes the narrative around the fact that the federal government has very solid fiscal balances," said Craig Alexander, chief economist at Deloitte Canada. "The government of Canada is actually in better shape than almost all of its international peers." There are concerns the Liberals' deficit-spending plan at a time of economic expansion could lead far deeper down the deficit hole in the event of a recession. The document noted potential risks still facing the Canadian economy — and government finances — including potential slowdowns in global economic growth, Canadians' high household debt and "looming global trade friction" due to the policies of U.S. President Donald Trump.